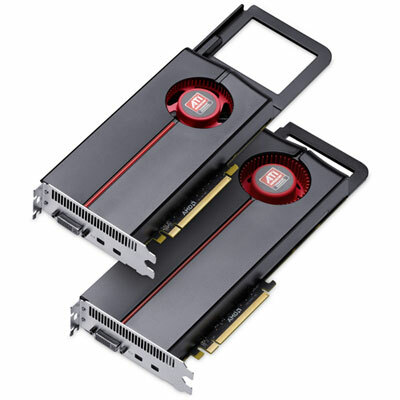 When Apple announced the new 2010 Mac Pros, they finally added support for two new ATI Radeon HD graphics cards for the Mac Pro. The new Mac Pros can be configured with either the ATI Radeon HD 5770 or 5870 cards. Existing Mac Pro owners had been hopeful that they would be able to easily upgrade their existing Mac Pros to these same cards. Apple has finally started listing the standalone graphics card upgrade kits on their website, but it doesn't appear to offer existing Mac Pro users many new options. The 5770 part is essentially a replacement part for the newly shipping Mac Pros and apparently does not officially offer an upgrade path to existing Mac Pro owners. Meanwhile, the 5870 card (which isn't shipping yet) does offer an upgrade path, but only for 2009 Mac Pro owners. Apple still offers the ATI Radeon HD 4870 as an upgrade option for both 2009 and 2008 Mac Pros. The 4870, however, remains priced at $349 but is said to offer similar performance as the 5770 card.